The Millennial generation, also known as Generation Y, consists of consumers who were teenagers around the turn of the Millennium (birth years from roughly the early 1980s to the early 2000s). The generation came after demographic cohort Generation X. Retail industry professionals see high potential in Millennials as their annual expenditure is expected to increase from 600 billion U.S. dollars in 2013 to 1.4 trillion U.S. dollars by 2020. That will equal a share of about a third of total U.S. retail expenditure. Recent statistics show that when asked why they shop at physical stores, some 63 percent of Millennials stated that it is because they do not have to wait for products to be delivered. 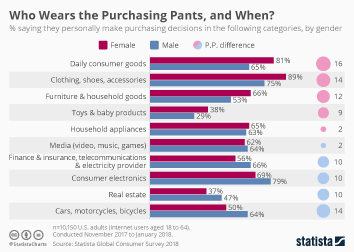 As of 2016, the average female Millennial purchases about eight hundred U.S. dollars’ worth of apparel annually, a lower amount than Generation Xers but higher than that of Baby Boomers’. Female Millennials also tend to own a higher number of beauty products than women from older generations. In general, Millennials are seen as internet and tech savvy consumers: by 2019 nearly 80 percent of Millennials are expected to have made an online purchase in the United States. A 2017 survey has also shown that 12 percent of Millennials always use digital coupons for online shopping purchases. Social media sites such as Facebook, Pinterest, and Twitter are also being used to advertise various products to their users, a high percentage of whom are Millennials. Although there are dozens of different mobile wallet apps, the Paypal app was by far the most popular among Millennials in 2016. Number of Millenials in the U.S. Grocery share of CPG dollar sales of Millenial shoppers in the U.S.